It’s Easter Weekend! Its the time of year we Christians celebrate Christ’s atoning work for us on the cross and his ressurection, which we participate in through baptism into Christ. In light of the fact that it is easter weekend I will be blogging on Richard Swinburne’s Responsibility and Atonement this easter weekend. I hope to show that Swinburne’s atonement is full of shortcomings. Today, on Good Friday we start of by looking at his atonement theory. 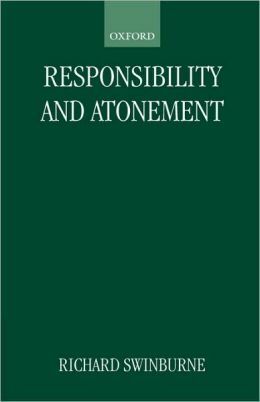 Swinburne’s book Responsibility and Atonement is an attempt to articulate a moral philosophy which can be accepted by Christians and non-Christians alike and then articulate the theological consequences of this system. The first seven chapters are done without any reference to theology, and mainly focus on the notion of responsibility. In these chapters he covers concepts like moral goodness, free will, merit, rewards, and punishment. The second part of the book is devoted to the theological consequences of this moral system. Here he covers concepts like morality under God, sin, redemption, heaven, and hell. Although all of these chapters are relevant to Swinburne’s doctrine of atonement the heart of Swinburne’s doctrine is found in chapters five and ten, “Guilty, Atonement, and Forgiveness” and “Redemption” respectively. In this blog series I will articulate Swinburne’s doctrine of atonement, then I will present three shortcomings of his atonement theory. Since Swinburne’s theology is based off his moral philosophy it will be helpful to begin by examining his understanding of atonement between humans before we examine his theological position. In chapter five Swinburne offers four components for making atonement: repentance, apology, reparation, penance. He begins by saying that guilt is analogous to debt and that it an be removed “either by the action of the wrongdoer (in some way) paying it off; or by the action f the victim (in some way) taking compensation.” However, to make perfect removal of guilt, the wrongdoer must make atonement and the victim must forgive the wrongdoer. Atonement is made when the wrongdoer performs these four components. First, the victim must repent. He or she must acknowledge his own her wrongdoing and acknowledge the fact that his or her actions were wrong, he or she must also must resolve to amend the wrong. When the wrongdoer does this privately, the wrongdoer makes repentance. When the wrongdoer does it publicly the wrongdoer makes an apology. Both private repentance and public apology are involved in the act of making atonement. Atonement also involves reparation. Reparation involves achieving the restoration of the status quo (there are certain cases when it is impossible to restore the status quo but an attempt must be made.) Reparation will cost the wrongdoer something, and only the person wronged can decide of the reparation is adequate. One can think of reparation as compensation to the person wronged. Finally penance is involved. Penance is a token of sorrow in which the wrongdoer does something which costs him something. By making penance the wrongdoer makes his apology “serious.” Penance goes above and beyond what is involved in making reparation. These four things, apology, repentance, reparation, penance constitute the work of atonement. However guilt is only removed when the work of atonement is made and the victim forgives the wrongdoer. Swinburne makes it clear that he believes that mere forgiveness cannot remove guilt, atonement and forgiveness must go together for guilt to be removed.